Arm Assembly : Arm and Column rigidly built with reinforcement ribs to reduce distrortion, to give high capacity and long lasting accuracy. All Shafts made of MiCr alloy steel with hardness 55 HRC. 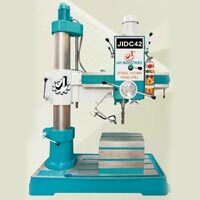 All Four splines and six splines of shafts are GROUND on Spiline Grinding Machine. 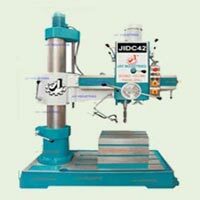 6 autofeed having near geometric progression for all processes to be done like drilling, reaming, boring etc. Overload Safety clutch system for tool protection and machine protection. Spindle auto-stop with travel adjustment. Spindle Lock System for milling Operation. Spring : Heavy duty Compression spring has replaced old conventional type coil spring. This ensures far more life than conventional Springs. 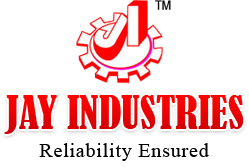 Limit safety devices are used to assure security while arm up-down, arm lock, spindle deepth adjustment. Left hand Operation with ergonomic world class design. 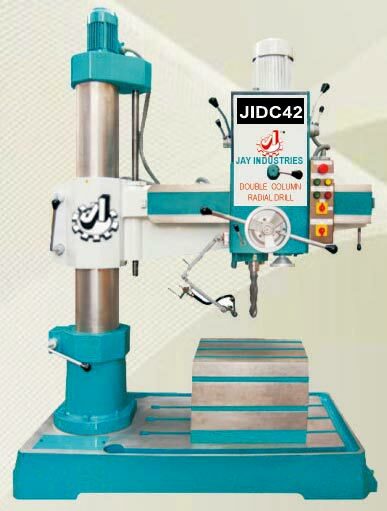 Independent locking of drill head with arm, arm with sleeve and sleeve with column for easy setting. 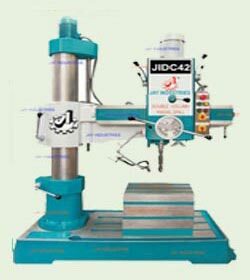 Use of high grade- fine grain materials and precision manufacturing guarantee long life of machine. Spindle is fitted with Precision Angular Contact Bearings not the Taper Roller Bearings. Motor:Head Motor of 2 HP 960 RPM motor gives high torque as much as of 3 HP with 2 HP power.